The Embassy of Ireland, Abu Dhabi has announced the opening of a visa application centre in Dubai, in partnership with VFS Global, a leading outsourcing and technology services specialist for diplomatic missions worldwide. Earlier this year in June, the Embassy had opened its first visa application centre in Abu Dhabi. The Dubai centre, the fourth outsourced processing centre for Ireland visas in the GCC, has started accepting visa applications from non-UAE nationals who are based in the UAE and who require a visa in order to enter Ireland. In addition, they will no longer need to visit the Embassy and instead they should submit their visa applications only at the VFS Global centres in the UAE. Opening the visa application centre in Dubai, minister Mary Mitchell O’Connor, TD Ireland, and accompanied by ambassador Aidan Cronin, Embassy of Ireland, Abu Dhabi, said she very much welcomed the opening of the centre and that the new external visa application centre located in downtown Dubai and operated by VFS Global will provide an excellent streamlined service for non-UAE nationals who are based in Dubai and who require a visa in order to enter Ireland. 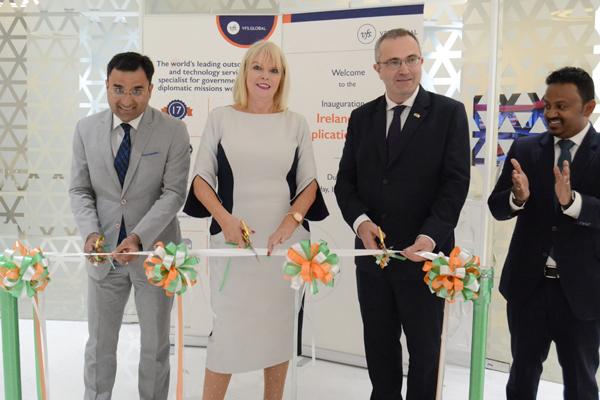 Ambassador Cronin also welcomed the opening of the centre and added that this is the second visa application centre in the UAE and the fourth outsourced processing centre for Ireland visas in the GCC. He also said that VFS Global provides a whole range of services for the customer. The centre in Dubai is located at Level 3, Falcon Phase 2, Wafi Mall, Umm Hurair 2. The visa application centre is managed by professionals who are trained to provide secure and time-efficient processing of entry permit requirements in a friendly ambience. Applicants can also opt for the comfort of a Visa @ Door step service or the Platinum Lounge for even more personalised service.